Since 1989, Acorel is recognised worldwide, in all market segments, as one of the global leaders in automatic high accuracy people counting solutions and people flow analysis. Acorel offers innovative and high-quality solutions tailored to your exact requirements and that combine the latest cutting-edge technologies with a very personalised service. With Acorel, you can be sure of our precise data and you can count on professional advice to help you make informed business decisions. Acorel’s mission is to help its clients make their business prosper by delivering relevant, accurate and reliable information that will help our clients make the right operating decisions. That is why Acorel strives to understand the whole value chain of a business, from assessing and qualifying real-time people flow, to interpreting big data. Acorel continually developed its sensor technology to optimise performance. The sensors have now reached a guaranteed 95% accuracy. In 2012, Acorel made a technological breakthrough so that it can now offer its clients the best technology at the best price. The sensors on offer today are the best on the market: 3D stereoscopic video sensors and laser sensors that both deliver accuracy levels of over 98%. Depending on a client’s requirements, our experts will suggest one of the two technologies, but they can also offer alternative solutions, taking into account a client’s needs and potential limitations. A team of experts focused on your needs that is able to offer you the best-suited solutions. Whatever the limitations, Acorel will implement a complete solution that you can rely on to deliver the best return on investment. A team of experts will provide you with an overall high-quality and high-precision counting solution worth investing in because you will be able to make decisions based on relevant data. A team of experts will assist you with data analysis to optimise the management of your operations. Acorel will make sure you reap the benefit of your investment. To view the Acorel overview brochure click here. Catching a flight to go on holiday or a business trip can sometimes feel like a true race against time: find a parking spot, check in your luggage, go through security, go through passport control and finally get to your gate. These same problems also exist in ferry and cruise terminals. There are so many bottlenecks that waste passengers’ time, cause stress and prevent potential customers from spending time in duty free shops, newsagents and restaurants. The solutions developed by Acorel make it possible to obtain real-time information and perform a predictive analysis of passenger flows in all key locations. True operational intelligence tools, they make it possible to anticipate needs and take the necessary measures in the event of changes in movement or crowding. Each head of unit receives information either at the central control station or directly on his or her smartphone. The head of unit and their team can, at any point, be informed of any malfunction thanks to an alarm and an incident report. They can react accordingly, all the while optimising staff management. Displaying past data is also a way to verify that the various service providers (private security services inspecting luggage, for example) meet their service commitments. 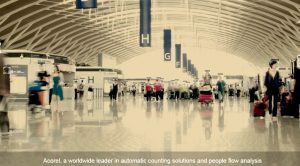 Thanks to Acorel’s counting systems and its user interfaces, you can decrease the time spent at mandatory transit points and, as a result, reduce passenger stress, avoid disruptions and limit agitation. The Lidar (Light Detection And Ranging) is equivalent to the Radar technology ( RAdio Detection And Ranging), but for the light. It operates in the infra – red spectrum (non visible light). Our Lidar performs fast scaning on 4 layers of more than 110°. They return obstacles and targets distance up to 30 meters while accuracy reaches 2cm. This high frequency allows detecting people as well as their movements, with a very high level of precision in any type of environement. 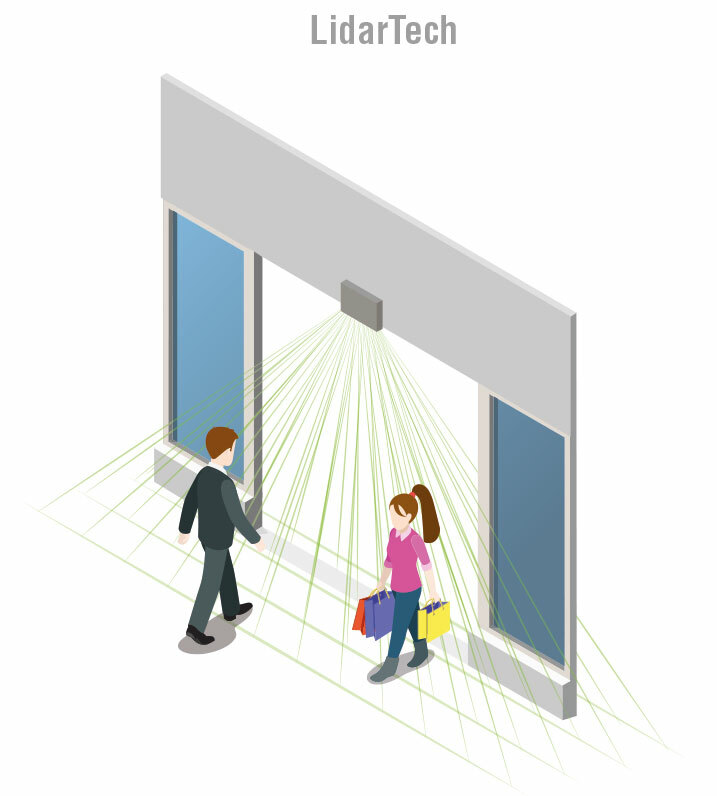 Lidars are not impacted by light change (they can scan in dark rooms). 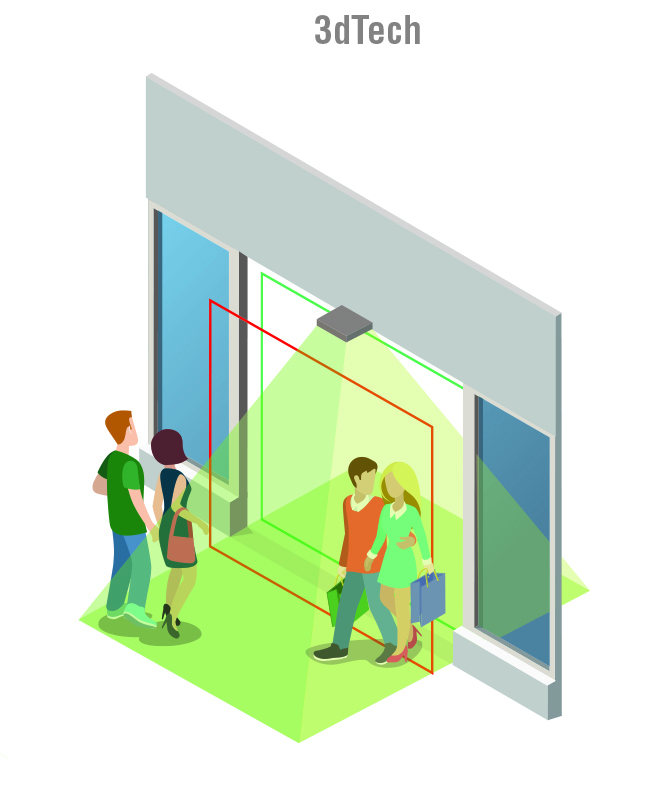 Provides better cost and performance with low ceiling areas (compare to video based technologies). Same solution allows area counting and tracking in any type of room. 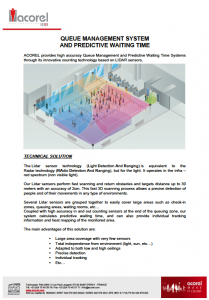 The only technology that makes it possible to acheive high levels of accuracy in the people flow analysis requiring an overhead installation at access points to allow detection of people entering and exiting even when there are several people walking side-by-side (bidirectional counting). Together with the sensors, Acorel also offers intelligence in a combination setup which makes it possible, among other things, to access all counting data in real time as well as manage maintenance information. The high-precision stereoscopic sensor works just like the human eyes. Thanks to 2 different cameras, it creates a 3D image. An algorithmic analysis of images in real time makes it possible to follow any movements in the detection field. Proof of accuracy through videos that make it possible to avoid manual counting campaigns, which are complicated to set up, costly and of relative precision. Adapted for harsh environments: complies with, among others, the EN50155 standard, and is not affected by climatic variations (variations in temperature). This technology makes it possible to measure the exact distance between the sensor (transmitter) and the people in its field of vision (target). Raw data are sent to the counting system via a communication bus. Up to 3 laser heads can be connected together to one processing unit in order to cover large entrances.